Hey folks, this week we were lucky to be joined by returning guest to the podcast, horror author J. (James) Thorn. Ee discussed James’ ever changing journey along the winding road that is self-publishing and uncovered everything from his Youtube channel/podcast, Dark Arts Theater, to his collaboration with Joanna Penn on their novel, Risen Gods as well as their nonfiction book for authors titled Co-writing a Book: Collaboration and Co-creation for Authors. 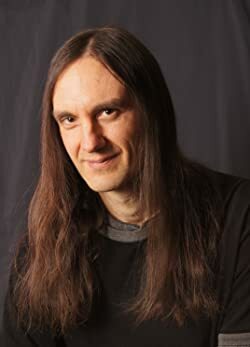 J. Thorn is a Top 100 Most Popular Author in Horror, Science Fiction, Action & Adventure and Fantasy (Amazon Author Rank). He has published over one million words and has sold more than 150,000 books worldwide. In March of 2014 Thorn held the #5 position in Horror alongside his childhood idols Dean Koontz and Stephen King (at #4 and #2 respectively). He is an official, active member of the Horror Writers Association and a member of the Great Lakes Association of Horror Writers. J. is a contributor to disinformation.com and a staff writer for HeavyPlanet.net as well as a founding board member of the Author Marketing Institute. You’ve co-written a book with Joanna Penn – Risen Gods – tell us about that? And you guys did some non-fiction stuff too, right? Chrishaun asks: how big was that draft in 19 days? You’ve released the audio book version of your book, how did that happen? How are you approaching marketing with the audio books, are you doing anything different with that? For those who haven’t heard about your ambitious Dark Arts Theater project, can you give us a brief synopsis of what that’s all about? Do you think it (podcasts) helps sell your books though? Tell us about the Horror Authors Podcast that you do with Zach Bohannon? What made you and Zach come together and decide to do a show? How has collaboration made you a better writer and what are the pitfalls? How different was the process of collaboration on the non-fiction book versus the fiction? Does that mean you’ll do more collaboration with Dan P in the future? How did you handle the legal side of collaboration, do you have a contract or just an informal agreement? How much money did you guys put into these ventures, was it a 50/50 split? Tell us about writing in Kindle Worlds, dealing with other people’s world (JR Rain)? If it was Clive Barker or Stephen King, would you write in those worlds? Would you worry about becoming a book of blood if you invoked the ire of Clive Barker? How do you go about asking to write in someone else’s world? What other things have you got planned for 2016? You always seem to be tinkering with different angles and ways to reach a larger audience. You’ve invaded Youtube and broken new grounds with the Booktracks. What new tricks are you testing at the moment? What programme did you use to write? What do you see coming in the self-publishing industry? Zach asks: Your new book is about to be released in four weeks, are you ready to tell us what it’s about yet? You offer a digital gift box for readers upon signing up for your mailing list, and that ranges from free books to audiobooks. How much of a back and forth reader conversation do you have with the free audios? how much does music effect your writing given that Music appears to be a big part of your life? You said you’re not in a band anymore but do you still create music independently?